Sheer garments are lovely and light and can add a feminine or elegant element to your outfit. Assuming you're not a Hollywood Starlet (or catwalk model) looking to get your picture in the news, the question often is, what to wear under them? How do you choose the right underlayer for your sheer garments? 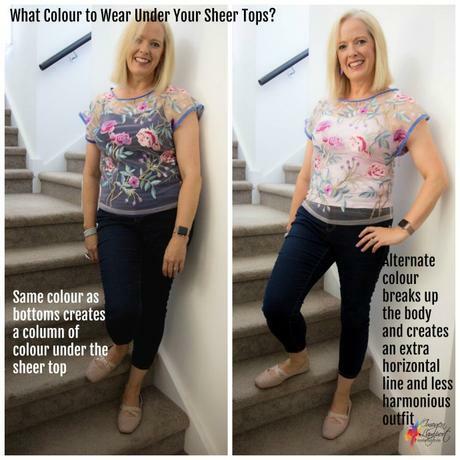 There are a few ways you can work style sheer garments to make them work well and a few things you want to keep in mind when choosing the colour of your under-layer. Will you be tucking in your sheer layer, or will you be wearing it over the top of another colour? This has a big impact on which colour layer to choose. If you're tucking, choose a colour that blends with the colour of the sheer top. Here this sheer white shirt has a white cami which works well when the blouse is tucked in. In this untucked version below, I've opted for the column of colour approach - a white under top that blends with my white trousers - creating that column of colour so there is no obvious break between top and bottom. Alternatively, if you don't want to match exactly, as I've done in the outfit below, I'm using similar value colours rather than different ones (value = lightness or darkness of a colour - find out more about it here), that way there is not a really obvious horizontal where one garment ends and the next begins. Here I've got on the same outfit, except my cami changes colour. Which is better? To my eye (and for my body shape where I really don't want to draw too many obvious horizontal lines across my tummy), it's the column of colour tank and jeans with the sheer top, rather than the alternate colour tank (the pink tank matches the pink tulle of the sheer top and would be an obvious choice normally). What you'll notice is that the change in colours underneath creates additional horizontals - not so flattering and breaks up my body more obviously. The navy tank creates a solid column of colour with the jeans, and then allows the sheer top to be the hero of the outfit. If I want to wear the pink tank with this top, I'd wear it with a light bottom, such as white - so that the difference between the baby pink cami and the skirt/pant is less obvious and it doesn't draw the eye to that broadening horizontal where the hem finishes. It's such a simple little trick, as so often your immediate thought when choosing an underlayer is to go with the same colour (or similar) to that of the top, when instead it can be more effective and flattering to go with a colour that is the same as your bottom garment. Another great way to wear a sheer is over a solid colour outfit - like this dress. Wearing a colour makes the texture and pattern of the sheer lace duster more obvious and turns it into a feature. In this example wearing a sheer green chiffon kimono over a solid green dress, which ties the colour of the background of the print to the dress colour. Why not make the underlayer a hero like I've done here with the green cami under the white broderie-Anglaise top. The green is the hero - and I've picked it up in my accessories linking the outfit together. It works best when either the two tops have the exact same hem-length, or when, like here, each hem ends at a flattering point on your body.